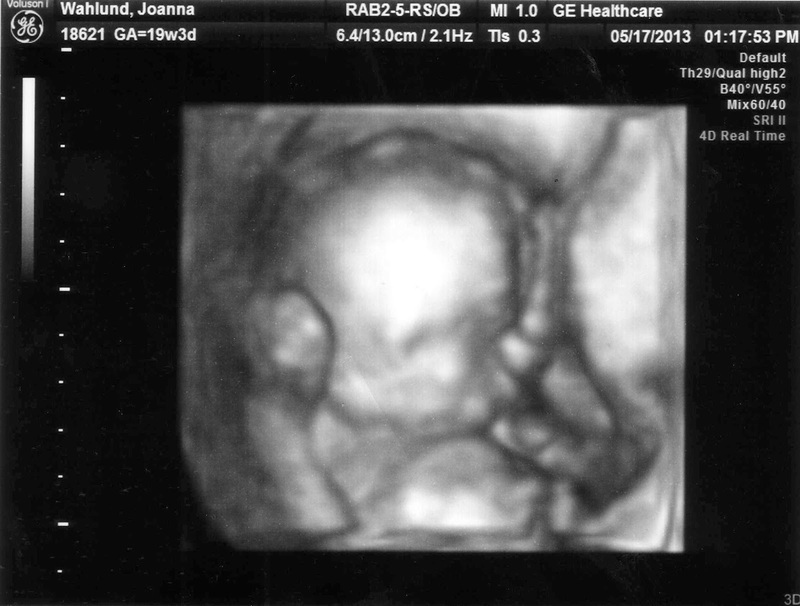 His/her sweet little face in 3D. A picture that clearly shows one of his/her club feet, although during the u/s itself I didn't notice. I thought everything went well. In hindsight, when the tech measured the baby's femur he didn't say much and changed the subject (I think he asked me if I was hoping for a boy or a girl), but at the time I didn't notice. He stated Baby was measuring right on target, printed out some pictures for us, and mentioned he'd need a few minutes to prepare the report before giving it to my OB. All fine, all routine. When we were called back into my OB's office, it did seem to take a little longer than usual for him to come in, but I dismissed that as well. A busy day for him, I thought. Maybe he'd had to deliver a baby or two that morning and was behind schedule as a result. When Dr. N. did come in, it wasn't with the big smile I was accustomed to seeing from him. He glanced at the kids, who were waiting in the corner of the room with Collin, and hesitated for just an instant. Then he sat down and looked right at me. "We need to talk about the ultrasound," he said. I didn't understand why he looked so serious. Surely everything was fine. Wasn't he here to tell me that everything looked great, as he had twice before, during my pregnancies with Violet and Gabriel (my two youngest children)? He looked me in the eye, making sure he had my attention. "The baby has clubbed feet." My first reaction was denial. No. Not my baby. Everything had looked fine. The tech hadn't indicated anything was amiss. He was wrong. He had to be wrong. As Dr. N explained that the results of the ultrasound showed bilateral club feet, my first thought was of my friend Monica and her baby Roslyn. And now Dr. N was telling me that the same thing had happened to my baby. I was having trouble wrapping my mind around it. I'd had four physically healthy kids and had expected that #5 would be equally healthy. But s/he wasn't. We talked about what the treatment would involve, and my mind was in a whirl. Casts. Braces. Possible surgery if the baby was in the 5% for whom casting and braces didn't work. 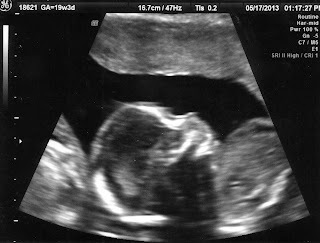 Dr. N inquired if we'd found out the baby's gender, and we said no. He said, "I was just curious, as boys are twice as likely to have club foot than girls." We spent the last few minutes of the appointment talking about my health -- my recent bout with bronchitis in particular -- but I was having trouble focusing on me. 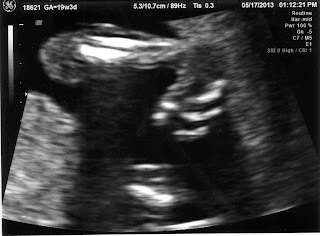 While I did experience some disappointment that the diagnosis was confirmed (I'd nursed a tiny hope that, perhaps, the findings of the first ultrasound had been some weird fluke and the baby's feet were not clubbed), I was relieved to know that there were no larger issues or syndromes at play. Now that several months have passed since the baby's diagnosis, I'm feeling more confident about the journey ahead. I know it won't be easy, but nothing worth doing ever is. In my next post I'll share some of the resources and information that have helped me learn more than I ever thought I'd know about clubfoot. It will be okay I promise. Like you I went to my 20 week U/S with my sister (my partner was at work) happily in March of this year. I was pregnant with twin boys. In retrospective Baby A's head did look funny. I should have been more worried. She went on to say that Noah had bilateral clubbed feet, hydrocephalus and SB. But I wasnt. Back then, I didnt know Noah had SB. My OB said "Baby A has SB". I remembered being dazed that whole day. The lady OB told me to take a sick day off work. I work in a public library. That day was horrible. She even gave me abortion leaflets to read. Looking back, I'm glad I didnt terminate though. Clubfoot and SB are birth defects of the spine and foot. My child with SB is not a "problem". He has brought us more joy then you will ever understand. perhaps you don't realize it, but this post was written well over a year ago... my son is doing great and I'm fully aware it will be okay. I also never called any kid with SB or clubfoot a "problem" - and I think I can understand the joy that children bring as well.